My latest project is engraving a gun that a friend Allan Owens has just finished. Allan has built a number of punt guns before, including the restoration/rebuild of the famous ‘Big Tom’, and this is his 15th gun, and I believe his first non punt gun. 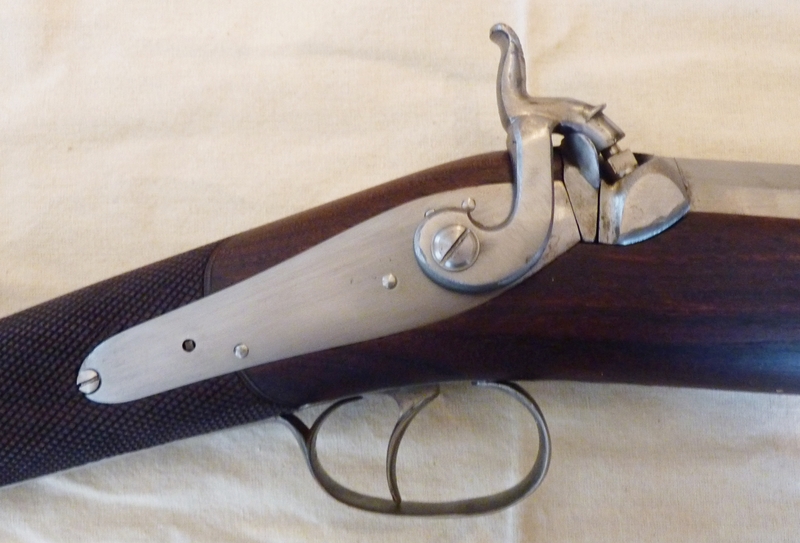 I was a bit reluctant to cut my engraving teeth on his beautiful new gun, but he insisted, so I’ve got to do it! Yesterday a parcel of the smaller parts arrived – we had already discussed what style of decoration was appropriate, and agreed that it would be a very plain gun – I’ve got the lock design sorted, and am working on the rest, but while it is still waiting the first touch with the graver, here are some pictures of the gun. So far I’ve fixed the parts onto blocks so that I can hold them in the engraver’s vice without marking them – no need to glue them down as there are enough screw holes.